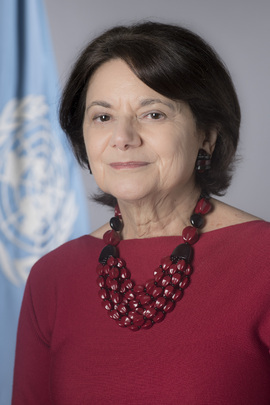 Rosemary A. DiCarlo of the United States assumed the post of Under-Secretary-General for Political Affairs on 1 May 2018. She was appointed by Secretary-General António Guterres and succeeded Mr. Jeffrey Feltman. As Under-Secretary-General and head of the Department of Political Affairs (DPA), Ms. DiCarlo advises the Secretary-General on peace and security issues globally, while overseeing "good offices" initiatives and field-based political missions carrying out peacemaking, preventive diplomacy and peace-building activities in Africa, Europe, the Middle East, Central and Southeast Asia and the Americas. She also oversees the United Nations electoral assistance provided to dozens of its member states each year. Ms. DiCarlo brings more than 35 years of experience in public service and academia. During her distinguished career with the United States Department of State, she served, among other functions, as Deputy Permanent Representative to the United Nations with the rank and status of Ambassador Extraordinary and Plenipotentiary. In that capacity, she represented the United States at the Security Council, General Assembly and other United Nations bodies. Prior assignments included Deputy Assistant Secretary of State for European and Eurasian Affairs, and Director for United Nations Affairs at the National Security Council in Washington, D.C. Her overseas tours took her to the United States Embassies in Moscow and Oslo. She also served as President of the National Committee on American Foreign Policy from August 2015 to May 2018 and was concurrently appointed a Senior Fellow and Lecturer at Yale University’s Jackson Institute for Global Affairs.